Over time, that sap, or tree resin turned into amber, preserving the lizard's remains, including its textured skin. This unique lizard-amber block somehow came into the possession of a man who donated it to the Miller Museum of Geology at Queen's University in Ontario, Canada, in the 1980s, but the man didn't report the artifact's age or provenance. Handyside began looking for clues by reading as many studies about amber as possible. Then, she and her colleagues analyzed the chemical composition of the small, 4.7-inch-long (12 centimeters) piece of amber, learning two key facts: First, the amber was real, meaning "it proved it wasn't a fake," an important point given that so little was known about the sample, Handyside told Live Science. And second, "we found it did match up quite well to a Dominican [amber] sample," although the results weren't conclusive, she said. The researchers also analyzed the amber's carbon and hydrogen isotopes (an isotope is a variation of an element that has a different number of neutrons in its nucleus). 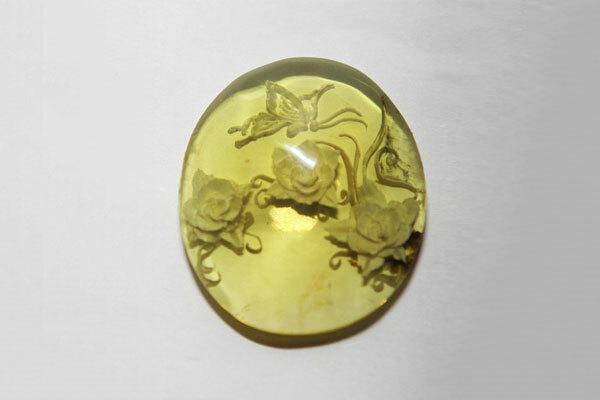 Results indicated that the amber was formed from the sticky resin of a flowering tree, or angiosperm. Moreover, the isotopic results suggested that the tree (and the lizard, for that matter) lived in an area with a lot of rainfall and dated to the Neogene, a period that lasted from about 23 million to about 2.6 million years ago. "It was an angiosperm-dominated, warm and wet environment," Handyside said. Next, the scientific team realized that the 2.7-inch-long (7 cm) lizard was likely a gecko, according to a detailed, 3D, digital model of the animal's anatomy that the researchers created from high-resolution X-ray microscopy scans. "We looked at the skull — the teeth are in place, the ear bones are there [and] we've got some flesh," Handyside said. "It's fantastic." She said she plans to examine the gecko's anatomy in minute detail in the coming months, with the hope that she and her colleagues can figure out how the creature fits into the gecko family tree. But for now, she's calling it Spike. A quick look at Spike's anatomy shows that it has "extremely elongated digits" and curved, Handyside said. "When you think of a gecko, you think of short, stubby, fat digits and sticky pads. That's not what we're looking at," Handyside said. "We have something that is more arboreal." If the gecko was a tree-dwelling creature, then its demise actually makes sense. "It's in a tree — it gets stuck in tree sap," Handyside said. The research, which has yet to be published in a peer-reviewed journal, was presented Aug. 24 at the 2017 Society of Vertebrate Paleontology meeting in Calgary, Canada.